Just Imagine! SAN Received N1.7Billion As "Legal Fee"
It appears being a SAN is now the ticket to get into money laundering for corrupt politicians who steal Nigeria's money and pass it to some SANs to hide for them and take some percentage. What kind of case will you defend for someone to charge as much as N1.7bn as "Legal Fees"? Hmmm! 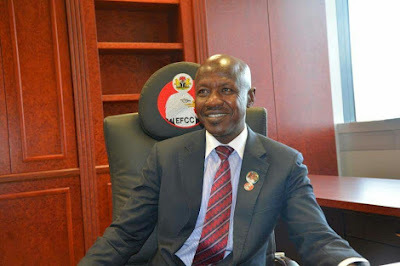 The acting Chairman of the EFCC, Mr Ibrahim Magu, says some Senior Advocates of Nigeria have been frustrating the anti-corruption war by knowingly supplying the technical know-how and helping in the dispersal of the proceeds of crime. The piece was written to coincide with the annual general conference of the Nigerian Bar Association, which begins in Abuja on Monday (today). “The same lawyer with a turnover of N3,765,414,995.24 only paid valued added tax of N7,051,928.24. The N300m cash payment which the senior lawyer received from a South-South state government in an election petition matter in 2016 was never captured in his tax submissions to the Federal Inland Revenue Service. “Another senior lawyer who is quick to advertise himself as the nemesis of the EFCC, has a turnover of over N5.1bn with an assessed total tax liability of over a billion naira between 2010 and 2017. Sadly, he merely declared a meagre N8m as gross earnings for 2014 and 2015, and N10m for 2016,” Magu said. The EFCC boss said there was a need for lawyers to demand to know the sources of income of their clients before receiving any money. He appealed to lawyers to put the interest of Nigeria ahead of monetary consideration.